We’ve had a few glorious days up here and all the cherry blossoms are out making me feel like it’s already spring. The tot and I have enjoyed getting back outdoors and starting our garden. While planting our new strawberry plants I had an idea for an art activity that might also introduce her to a few new things to eat. I dug around in the fridge for all things veggie and green, and then we walked on over to the local grocery store to pick up a few additional seasonal goodies. With some fresh asparagus and peas in our bag, we headed home. This is a fun art activity to do with kids of all ages. The really young can go nuts stamping with the veggies, creating random collections of shapes and older kids can spend more time concentrating on the creation of a unified and balanced finish artwork. 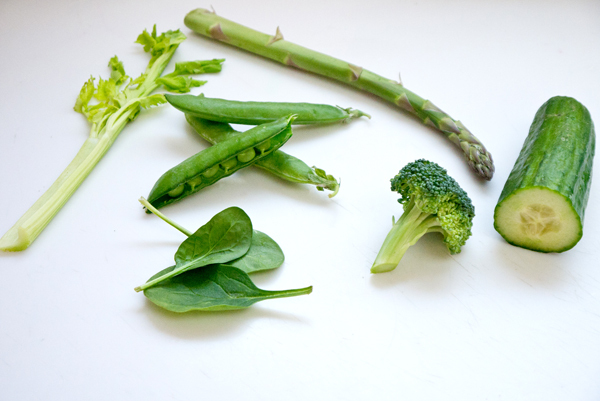 Start by gathering together all the green veggies you have. 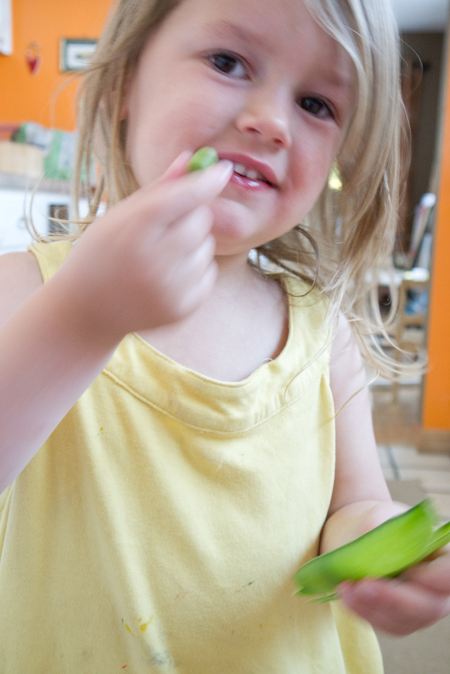 We used broccoli, asparagus, cucumber, celery, peas, and spinach leaves. If your child is old enough, allow them to slice some of the vegetables for creating better prints (with supervision, of course!). We sliced the broccoli and cucumber to reveal a flat surface to print. We also opened up one of the peas to create a unique pattern. Get out some green paint – tempera or watercolor – and begin slathering it on with a brush. 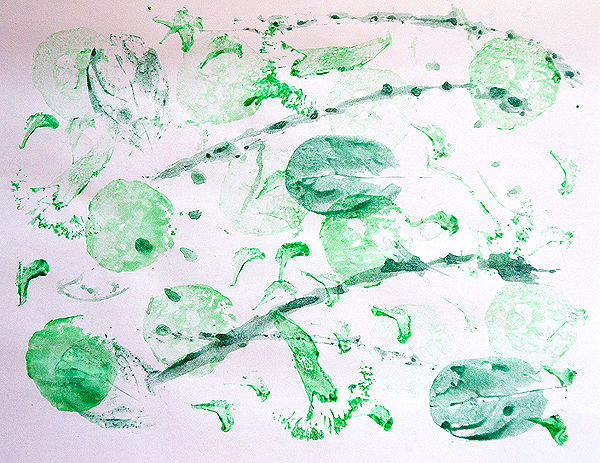 Now your child can gently press the spring green vegetables onto a white sheet of paper, revealing a fun print. Keep painting and printing until the entire paper is covered. Once the paper is dry, older kids can hone writing and language skills by using a black marker to label one of each of the prints. 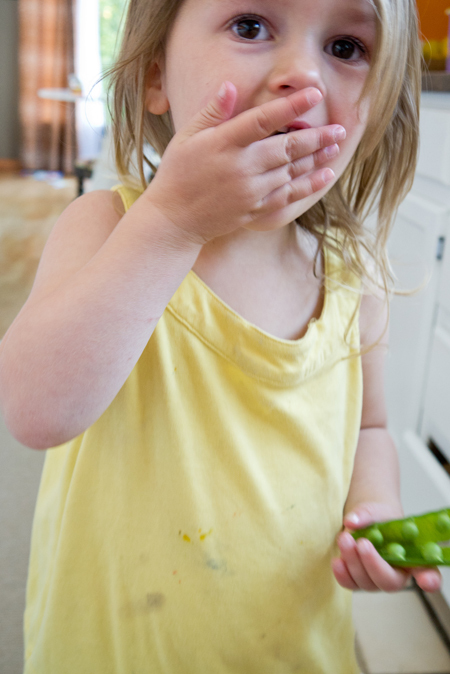 But, that’s not all – gather everyone around for a spring green veggie snack! 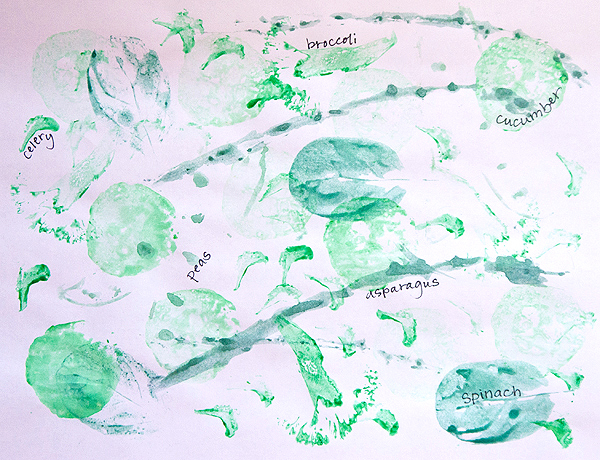 Place a few samples of the vegetables you used for making the prints (fresh ones – not the painted ones! ), and invite your child to take a taste. You can even mix up a simple dip using plain yogurt, dill, salt and pepper, or dip in one of your favorite salad dressings.